A few days ago my wife and I were talking about what to do with the ashes when one of us keels over. “You don’t have to do anything with mine,” she said. “Sprinkled?” She laughed at the word. We were both laughing, actually. Sprinkled. The word seemed better suited to a sunny tableau involving laughing children and a Good Humor truck. “Just burn them,” she said. “You can’t burn ashes.” We started laughing some more. What a hilarious topic! We went back and forth for a while. I finally harangued her into agreeing that I’d take her to Amsterdam and throw her at the door of the place that used to be the club where she danced through her adolescent and young adult years. I’ll keep my own specific requests to myself, but if all goes according to plan my extinction will result in my widow being led away in handcuffs by the Fenway Park police. 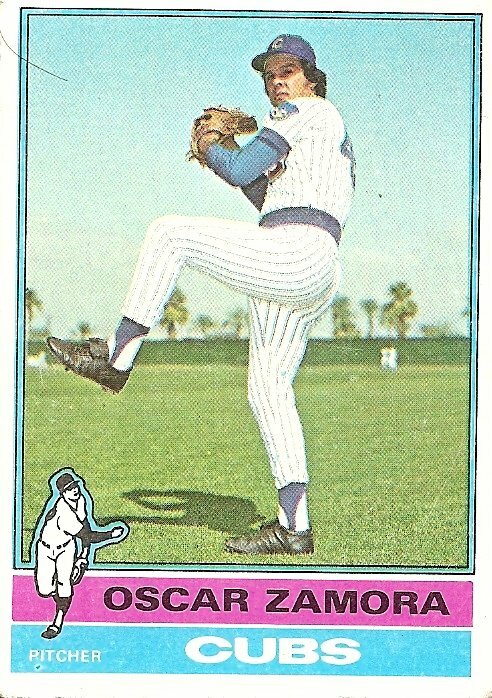 Oscar Zamora toiled in the minor leagues for nine seasons before making the major leagues at the age of 29. He was decent his first season in the big leagues, quite a bit worse the following season, worse still the season after that, and demoted to the minors the next year. At the end of that year he was sold to another team, who brought him back up for one more chance, which he squandered, posting a 7.20 ERA in 10 games, an effort that cast him into the oblivion beyond any back of the card stats. When the pitch is so fat, that the ball hits the bat, that’s Zamora. What traces will you leave? To date I’ve had a couple things named after me, but both fell into disuse long ago. The first was something called The Wilker, and it was a punishment invented by my high school ultimate frisbee coach. His name was Buzz and he was a surfer dude from Santa Barbara who was getting his phys ed degree from a nearby college, UMass, which he helped lead to the college ultimate frisbee national championship one year. He was probably the best coach I ever had both because he taught me a lot about the sport and because he was a nice guy and with his van and surferly ways made us all feel cooler by extension. But one day I just ditched practice to go to a pizza place and play the Star Wars video game with my friend Julian. I guess I figured that since I thought of myself as invisible then the whole world thought the same, and so no one would notice I was gone. But Buzz noticed, and the next day he gathered up all our frisbees and had me chase down his long throws one after another, which basically amounted to fifteen or sixteen wind sprints in a row. From then on, if anybody did anything out of line or stupid or lazy the team would clamor for them to be given The Wilker. The tradition, such as it was, only lasted the season. The other time I had something named after me was when I was a part-time liquor store clerk in my early twenties with no money and an aura of glowering desperation, and yet I somehow briefly dated a successful, attractive woman. She was, it was later determined, way out of my league. Somehow the whole improbable situation got wrapped up in me getting a $10,000 deal from a British publisher to write a book about Pearl Jam, a band I knew nothing about and didn’t particularly like. I raced around for a while thinking that my life was going to change completely, that I was going to be an exciting, successful, unlonely guy. “You’re so beautiful I can hardly keep my eyes on the meter,” I told the woman one night, quoting Woody Allen. We were riding in a cab to her apartment. “Who the hell are you?” a member of Pearl Jam’s publicity team demanded of me the next day. I was trying to request an interview with the band for the book. You are currently browsing the archives for the Oscar Zamora category.